Bird Dog Labs Litter! We are proud to be an AKC Breeder of Merit and Bred with H.E.A.R.T. 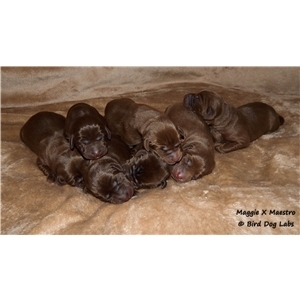 Breeder of some of the finest Labrador Retrievers available anywhere! This exceptional total package litter will make excellent prospects for field trials, hunt tests and the serious hunter. They also will have wonderful dispositions and can live as part of the family too! This is a proven repeat breeding with excellent feedback on previous pups! Born Decebmer 19th. Will be ready February 13th. Chocolate female and male available! Accepting $400 non-refundable deposits to hold picks! Birddog's Goodtime Magnet MH21 "Maggie" is the real deal. She has a tremendous amount of drive, yet is easy to train. She is very intelligent and learns new concepts quickly. Her desire to please is unparalleled. Maggie can flat out mark and works with you to get the job done. Maggie entered into training with Rusty Haglund of Trigger Time Kennels at 14 months of age and within 15 months earned her Junior, Senior and Master Hunter titles, plus additional master passes. Maggie is fantastic in the house and is undeniably the most loyal dog. She will do anything to please. Maggie is a unique girl when it comes to chocolate. You have to go back 3 generations before you see the first chocolate dog in her pedigree. 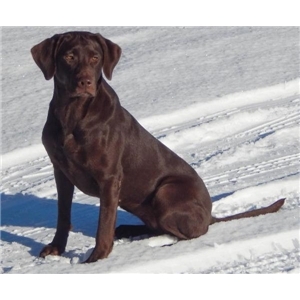 Her pedigree is loaded as well with highly sought after field trial-hunt test bloodlines as well as outstanding upland and waterfowl hunting dogs that we know personally. Maggie's sire is a MH QAA son of NAFC FC AFC Barton Creek's O'Mustad and grandson of FC AFC Land Ahoy. Maggie's mom is our foundation female that is out of MH son of FC AFC Watermark's the Boss. Maggie is absolutely gorgeous and has a very dark chocolate coat. She is extensively health tested as well and all clearances are verifiable online (OFA website and Paw Print Genetics Pedigree Database). We are an AKC Breeder of Merit as well as AKC Bred with H.E.A.R.T. Breeder. All of our puppies are born and raised in our home and are thoroughly socialized. We have a comprehensive puppy program and do everything we can to give them an excellent start. At the very minimum our puppy program includes early neurological stimulation (ENS-Biosensor), early scent introduction (ESI), introduction to wings/dead birds (live if we can get them this spring), gunfire from a distance, daily loud noises, crates, car rides, outdoor adventure walks, exposure to different environmental terrians, extensive socialization with adults, kids and many safe dogs of various ages, daily individual handling, intro to potty training, water (weather permitting) and much more. All puppies will have dew claws removed, appropriate deworming x 3, microchipped, vet checked with individual health certificate, 1st round of vaccinations and 30 month written hip/eye health guarantee and lifetime genetic disease against 15 different genetic diseases. We also post weekly pictures and or videos on our Bird Dog Labs Facebook page so you can watch the litter grow until ready to come home. Lots of references available and Lifetime Breeder Support. We stand behind our puppies! Accepting non-refundable $400 deposits to hold picks.